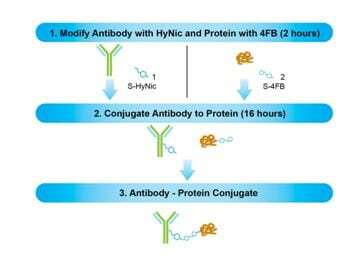 Solulink was founded on a proprietary, easy-to-use, catalyzed linker technology that enables faster and quantitative conjugation of biomolecules with higher efficiencies and yields. Biomolecule conjugation is fundamental to ELISAs, affinity chromatography, and bead assays. However, the standard maleimido, SMCC, and EDAC conjugation chemistries are notoriously slow, inefficient, tedious, and not easily measurable, adding unnecessary time and expense. At Solulink, we are seeking to change this paradigm with our proprietary linker technology. Solulink’s proprietary linking technology is built on an innovative, catalyzed, UV-traceable linker that offers greater efficiency and higher yield in a considerably simpler method. Solulink introduces two linkers: HyNic (6-hydrazino-nicotinic acid, an aromatic hydrazine) and 4FB (4-formylbenzoate, an aromatic aldehyde). In the Solulink strategy, biomolecule 1 is linked to HyNic, and biomolecule 2 is linked to 4FB, through primary amines or thiols on proteins, oligos, peptides, carbohydrates, or surfaces. Mixing of the two biomolecules, with TurboLink catalyst, aniline, allows the two linkers to rapidly, selectively, and efficiently react with each other. 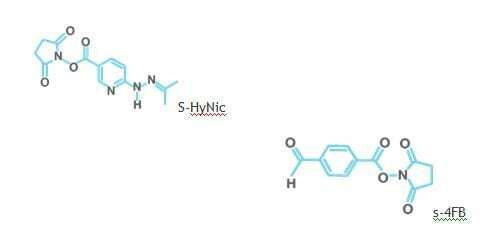 The result is two biomolecules conjugated through a UV-traceable, stable bond (bis-arylhydrazone) with measurable absorbance at 354 nm. Any two proteins, oligos, peptides, etc., regardless of molecular weights, can be efficiently conjugated. Solulink’s proprietary linking technology is available as linker reagents, easy-to-use kits, bead products, and in bulk quantities for research and commercial organizations worldwide to enable next-generation biomedical assays and detection systems. We invite you to visit our Products and Servicespages to find the product to best fit your application.